We are often told by market pundits and the financial media that staying invested over the long term is the best strategy for wealth creation. This may be true, but it does not help you to decide which market to stay invested in. Local investment advisors, particularly these days, are trying to keep investors calm and keep them invested in South African markets. This is a tough job, as our local markets have hardly beaten inflation over the past four years. Is the JSE just in a slump, or are there greater macro-economic forces at play which are causing the poor returns? The simplest way to understand local market performance is to contrast it against other markets. The world today is a truly globalised society, and the JSE is competing with other markets for your investment. Thus, you should price individual markets in US dollar terms over time, to evaluate the returns that you are receiving. This allows you to compare apples with apples. 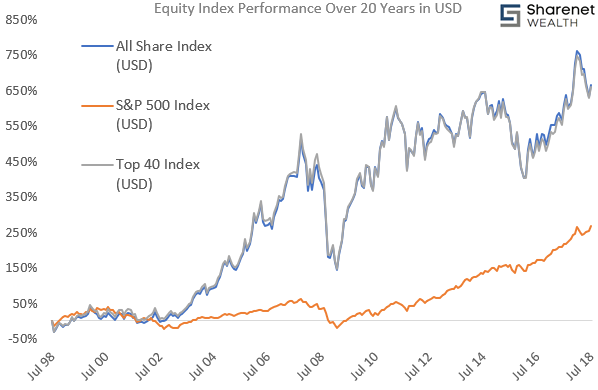 The chart below shows a comparison between the JSE All Share and Top 40 indices (South Africa) and the S&P 500 index (America). 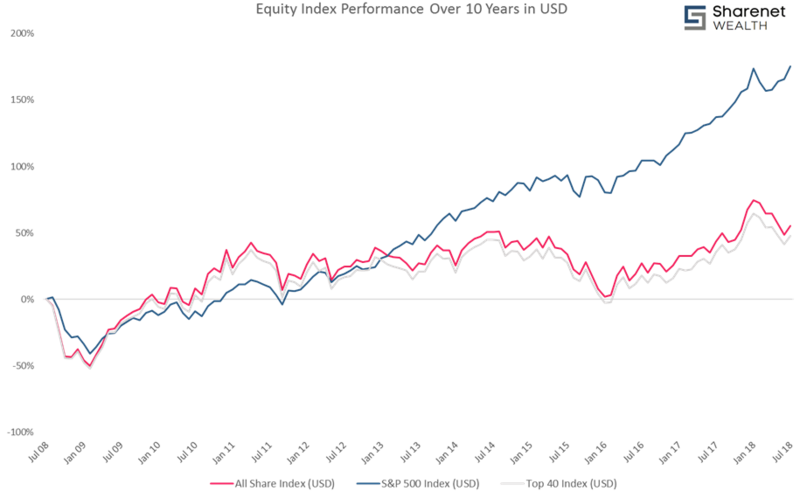 You can see that the JSE was a great place to invest over the last 20 years; returns during the 2000s were phenomenal. This specific chart is the main reason why investment advisors often say that the JSE outperforms foreign markets historically. However, the 10-year chart tells a different story. Here you can see that over the past ten years, the JSE indices have been outperformed by the S&P 500 index. The returns in SA have been around 50%, while those in the USA have been around 175%. Since 2011, In US dollar terms, the JSE has traded sideways and hardly returned anything - except volatility. When viewed on an even shorter time frame, such as a 5-year chart, the results are even more appalling. 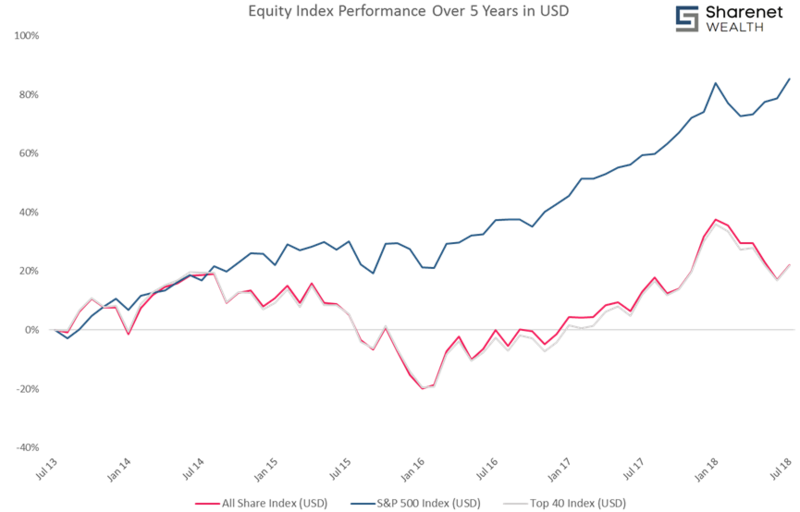 Local investors have made a paltry 20% return in USD over the last five years if invested in the local market, versus the 90% that they could have made if they were invested in the S&P500 index in America. In a nutshell, what these charts are showing you is that our economy was once booming. That boom came to a halt in 2007 and has been sluggish ever since. The question is, how can the average investor, who has a few thousand rand per month to put away, gain access to these foreign markets? The simplest way is through feeder funds. Feeder funds are local investment funds which are priced in South African rands but are invested in offshore funds. Basically, they invest your rands into offshore assets, which are denominated in a foreign currency. They are a simpler and more cost-effective vehicle to use than taking your funds out of South Africa and into foreign currency directly. They do not however offer you the protection of having your money domiciled offshore. How would you use feeder funds to build an investment portfolio for yourself? The simplest way is to establish your appetite for investment risk. You may be a conservative investor with a short time horizon, or a young professional who wishes to invest aggressively for over 10 years. Once you understand your risk profile, you can then easily construct a portfolio for yourself. In the charts below, I have compiled three separate offshore feeder fund model portfolios. One cautious (40% equity), one moderate (60% equity) and one aggressive (80% equity). The entire equity portion of each portfolio is invested in offshore markets, while the bond portion is invested locally. This is because bond yields are higher locally than abroad. The end result is a portfolio which offers a better risk/return ratio. This portfolio has returned 65% cumulatively over the past 5 years, beating both the global general equity benchmark and the local benchmark of SA inflation plus 3%. This portfolio has returned 70% cumulatively over the past 5 years, beating both the global general equity benchmark and the local benchmark of SA inflation plus 4%. This portfolio has returned 80% cumulatively over the past 5 years, beating both the worldwide multi-asset flexible benchmark and the local benchmark of SA inflation plus 5%. What all of these portfolios show is that over the past five years, if you had invested the equity portion of your portfolio offshore, you would have done very well for yourself - far better than even the top-performing local unit trusts. The main investment concern that we face as South Africans is that of political risk. We have precious little control of the decisions that politicians make in our country, and how these will influence the value of our local stock market and the rand. The ANC is proceeding with general economic policies that have recently been tried in Argentina, Venezuela and Zimbabwe. The outcome has never been good for investors trapped in those economies. Feeder funds offer investors who have budgetary constraints a way to protect themselves against these political risks. Diversification of your investments into stable foreign markets has the potential to significantly reduce the risks facing your investment portfolio. The rand has once again broken through R15 to the US dollar, highlighting the weakness of our local currency. Government policy on the economy is wrongheaded at best and downright dangerous at worst, and it is no surprise that South Africa finds itself currently in recession. For a more detailed analysis of South African economic data woes, read more here. Do you see any of this changing within the next five years? Protect yourself today by investing offshore. Complete the forms below to investigate your options. Contributions start as low as R1000 per month or a R25�000 lump sum. Ricki specializes in the field of wealth management with a focus on holistic financial planning. He has a keen interest in the investment fields of property, technology, precious metals and cryptocurrencies. Ricki also holds a Masters degree in Science from the University of Stellenbosch.